This position came up in the aji keshi discussion. 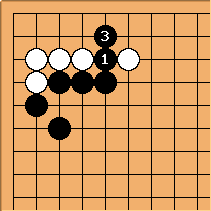 The conclusion was that B 1 is a ko threat, though not always a good move, and after 3 W is dead in the corner. My questions are if later in the game there is another ko, what is W's best way to get one or more threats of life in the corner? Making the L+1 group by playing left of is surely the most threats, about four.